Over the weekend the competition for the future development of Cologne’s harbour was settled. The mayor of Cologne, Henriette Reker, announced Danish architects COBE as winner of the competition. 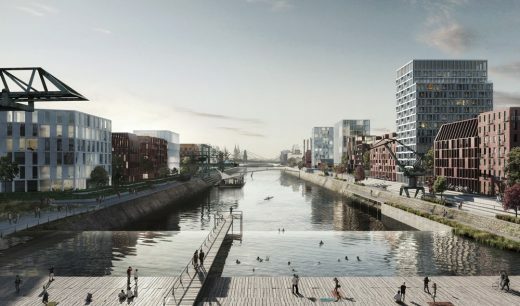 The project transforms the old industrial harbour into a lively and sustainable neighbourhood with a huge waterfall and a big public pool as the new landmark. The pool collects rainwater and waste heat from the district and becomes a new attraction in the city. 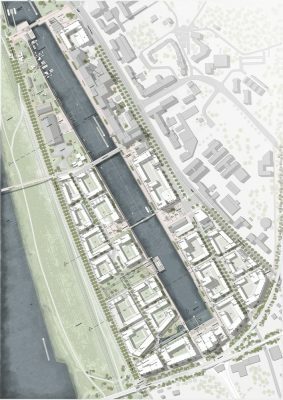 In February 2016, the City of Cologne and the urban development company, Moderne Stadt, arranged a competition for a new masterplan for the harbour area in Cologne, called Deutzer Hafen. The winner of the competition was Danish architects COBE in collaboration with German engineers Transsolar and German Atelier Dreiseitl, who are experts in water strategy and rainwater handling. ”COBE is very smartly questioning which of the existing buildings to keep and how to translate the old structures into a new harbour district. Out of all the insights gained in the public process, COBE has developed highly specific answers for the harbour development. All in all their concept visualizes a lively, colorful mixed neighbourhood, where the industrial heritage is tangible”, said Franz-Josef Höing, director of urban development in the municipality of Cologne and chairman of the competition jury. The 35-hectare area is an old industrial harbour south of the center of Cologne. For more than ten years, the city has been discussing how the area should be developed. The winning project takes its starting point in a reinterpretation of the historic industrial harbour and creates a dense urban building structure, active and climate proofed public spaces and innovative traffic solutions. What the approximately 200 people at the public presentation of the project noticed, however, was the establishment of a new public pool and associated waterfall. ”We have created a consistent sustainable project that is carefully adapted to the local climate. Flooding from the Rhine River is a serious problem in Cologne. Therefore, we have been working with a consistent proofing of the whole district by collecting rainwater in a big public pool, which is heated from waste heat from the neighbourhood. It solves a serious problem and simultaneously creates a unique attraction for the citizens. The project is already informally referred to as ”Der Pool ist cool!” by locals”, says Dan Stubbergaard, founder and creative director of COBE. The new neighbourhood is intended as a vibrant urban area with room for varied activities that is adapted to the different situations of high tide and low tide. Playgrounds in the neighbourhood are therefore always accessible regardless of the water level, while the promenade can be flooded. In flooded periods, you will be able to sail your kayak directly to your front door! Thereby, all public spaces are conceived very differently during the year. In addition, the neighbourhood will be a natural part of the new Cologne that can easily be reached by foot and bicycle and is well connected via public transportation. A new bicycle bridge over the Rhine River connects the new area directly to Cologne’s city centre. ”It has been a long and exciting process with the public and the city’s leaders in Cologne. After the first round of the competition we were criticized for having ”to much music” in the project. 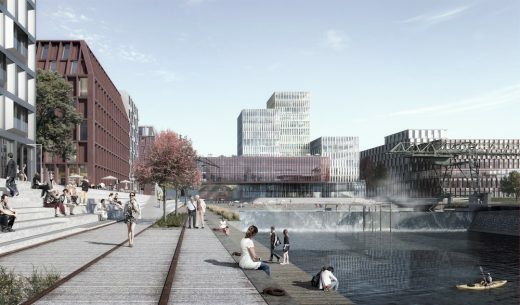 Therefore, we have focused on delivering a tight and flexible plan for the district in the second half of the competition, focussing on integrating the industrial cultural heritage,” says project director at COBE, Mads Birgens, who has been heading the competition project. It is not the first time that COBE is developing old harbour areas. The company has since 2008 been working intensively with the transformation of Nordhavnen (the North Harbour) in Copenhagen, where the first stage is nearing completion. 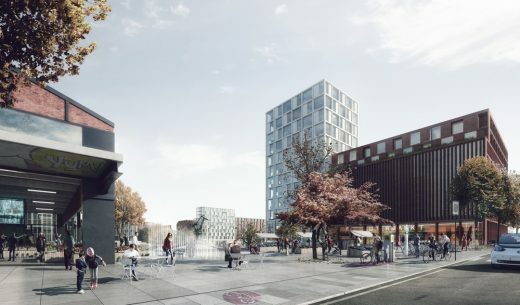 COBE is also behind the winning proposal for the transformation of Paper Island in Copenhagen’s inner harbour, where the process of the district plan is currently ongoing. Five teams from Denmark, Germany and Switzerland participated in the competition. COBE is already this year starting the further planning work of Deutzer Hafen.